Each year, you have to figure out how to keep your health care costs low and provide high-quality benefits for your employees. The Meliora Marketplace makes it simple. Using our platform, you can keep health benefit costs lower AND offer your participants more personalized coverage options. The Meliora Marketplace lets organizations of any size provide an engaging, smart, and individualized retail experience for benefits shopping. ​It's easy! You decide how much you want to give your staff for benefits and what products you’d like to offer. Then either use our inventory or provide your own partners and products to choose from. Want to help your employees? Want to help your employees find the benefits that fit them best? According to bswift, ask Emma is much more than an interactive decision support tool. She represents a whole new approach to benefits shopping, enrollment, and education, helping employees make more informed and personalized decisions across a range of benefits offerings—all through an engaging experience. Ask Emma guides employees through the buying process by asking a few simple questions and then suggests the plans that fit their individual needs. Unlike other tools in the market today, Ask Emma is fully integrated into the shopping and enrollment platform for a seamless consumer experience. Our interactive benefits advisor, Ask Emma, walks employees through each step of the enrollment process and gets to know their personal needs and preferences along the way by asking a few simple questions – including which doctors or hospitals they prefer. Using these answers, she presents the plans that best fit their specific needs. It is vital for every company to recruit and retain top-notch employees, and your benefits package can be the difference between attracting an outstanding employee or one who may not be the best fit for your organization. Increasing costs of traditional employer-sponsored health plans are making defined contribution the new normal across the U.S.
You decide how much. They decide what works. Defined contribution gives your employees a set amount of money to spend on coverage that meets their unique situation. Instead of providing the same, traditional benefits package to everyone, you allow your employees to decide what's best for them and their families. For example, if you gave your employees $350 a month for benefits, you could allocate $250 for health insurance and $100 for vision, dental, or other benefits. If you want to continue to offer plans that are 100% employer-paid — like life insurance or long-term disability — you can. Our decision support tools that make it easy for you to decide how to allocate the funds and you’re your employees choose what is right for them. The Meliora benefits portal isn’t just for Open Enrollment; this central hub is for both employers and employees. This portal gives you access useful content, including information about your company, a library of helpful documents, benefits and plan information, informative, and much more. This isn’t your run-of-the-mill health and benefits site; it's a true human resources and benefits location for employers and a single place for employees to choose the products that are right for them. We all know that the average employee doesn't know how much your company invests on them over and above their salaries. 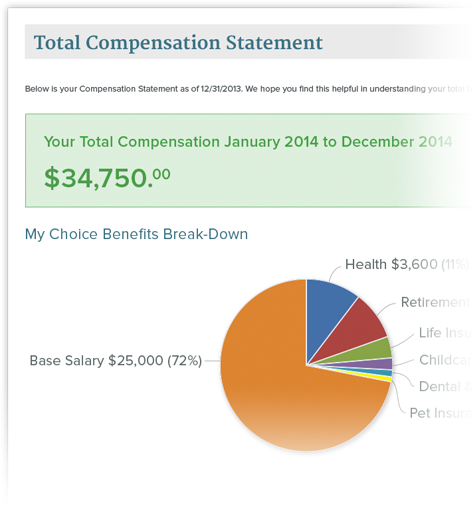 With Meliora Total Compensation Statements, you’ll find a cost-effective way to communicate the full value of their compensation and benefits. It's also a simple way to promote any unique benefits or special perks that sets your brand apart from others. We already store all of your enrollment info and can accept additional data from your payroll (or other) system, such as tuition reimbursement, 401(k), car allowances, and more. Our statements are highly configurable — with an unlimited number of fields that let you decide how compensation categories are named, organized, and displayed. Your employees can securely access their personalized statement online and print a copy at their convenience. Or if preferred, we can mail a hard copy of their statement. Day-by-day, our world is becoming more dependent on mobile devices, and benefits are keeping up with the changes. With Meliora, your employees will enjoy the added convenience of the Mobile Benefits Portal, so they can shop, enroll, and access their information at any time from their mobile device. It works on nearly every mobile device, including iPads, iPhones, Android phones and tablets, and more, via the internet or with the Mobile Benefits Quicklook app.